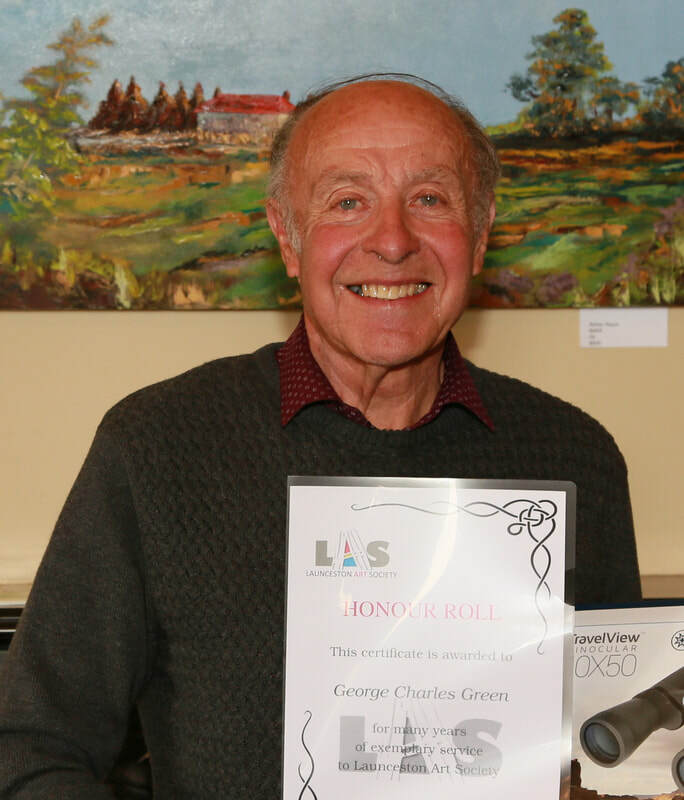 We are pleased to announce that our retiring Treasurer, George Green’s name has been added to the LAS Honour Roll, for services rendered to the Society. In careful consultation with his wife, Elwyn, we have a brief history of his art career. George studied Art as a subject in high school and was the only one in Tasmania who was accredited by the Schools Board of Tasmania. Later, George saw an advertisement for watercolour classes under the tuition of Rosemary Mastnak at her studio at Traveller’s Rest. So without hesitation he joined up with Northern Watercolourists. He was usually the first to arrive with easel and paint at the ready. He is still a part of that group today, though now dwindling as Rosemary lives today in Hobart. Some of his work has been sent overseas. One in particular, a sunset, he sent to India, but never came back! Thirteen years ago, when I was President, I searched for a Treasurer as Beris Cundall was retiring from the position. How lucky we were to find George, a retired accountant. We have never looked back, for over the past thirteen years he has presented at every committee meeting the LAS financial reports so professionally with a copy for each member to peruse. He committed to keeping us all on track and offer advice on any investment to be made. Each year he presented the financial records to the auditor in a highly professional manner. Organised, systematic, approaching his painting in the same way. So we present to you George, a gift and certificate with our grateful thanks for the past thirteen years of service. We are sorry to see you retire but wish you all the best in the future. The gift was instigated by your wife, Elwyn, who thought you would find them useful while relaxing in your atrium.